It’s heartwarming to see Martin Sanchez of Aporrea and Venezuelanalysis suddenly take an interest in investment. His latest dispatch is breathless about DaimlerChrysler’s announcement that they will invest $20 million to “expand production” in their Valencia plant, apparently for export. Central Bank for the Gross Fixed Capital Formation statistics and the 2001 Census for the population data. Just to put Martin’s write-up in a bit of perspective, $20 million, works out to less than 12 constant 1984 bolivars per person per year, so less than a dollar a year per capita. 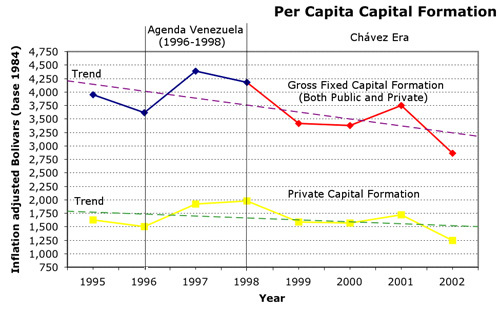 That’s less than half of 1% of the total gross fixed capital formation in Venezuela in 2002.